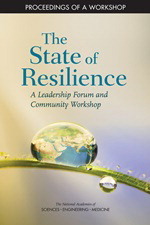 The State of Resilience: A Leadership Forum and Community Workshop: "Over the past decade, resilience has gained significant traction across the nation and innovative programs are showing exciting progress in building resilient communities. For communities to be prepared for future extreme weather and climate events, as well as the chronic daily stressors, the momentum of implementing and taking action to build community resilience should continue to be fostered and expanded. Building on its many efforts dedicated to increasing and enhancing resilience, the Resilient America Roundtable hosted the State of Resilience Leadership Forum and Community Workshop on June 28 and 29, 2016. This activity brought together diverse decision makers, experts, practitioners, and community stakeholders, including representatives from academia, government, the private sector, foundations, and nonprofit organizations, to consider the results of years of investment, experimentation, and research in building resilience, take stock of these many initiatives and efforts, and share their experiences in building more resilient communities. This publication summarizes the presentations and discussions from the workshop." 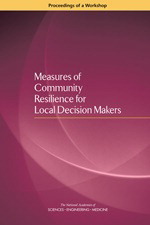 Measure of Community Resilience for Local Decision Makers: "The 2012 National Research Council report, Disaster Resilience: A National Imperative, identified the development and use of resilience measures as critical to building resilient communities. Although many kinds of resilience measures and measuring tools have and continue to be developed, very few communities consistently use them as part of their planning or resilience building efforts. Since federal or top-down programs to build resilience often yield mixed results, bottom-up approaches are needed, but are often difficult for communities to implement alone. A major challenge for many communities in developing their own approaches to resilience measures is identifying a starting point and defining the process. Other challenges include lack of political will due to competing priorities and limited resources, finite time and staff to devote to developing resilience measures, lack of data availability and/or inadequate data sharing among community stakeholders, and a limited understanding of hazards and/or risks. Building on existing work, the National Academies of Sciences, Engineering, and Medicine organized a workshop in July 2015 to facilitate the exchange of knowledge and information about ways to advance the development and implementation of resilience measures by and within diverse communities. Participants worked to gain a better understanding of the challenges these communities face in the pursuit of resilience and determine whether the approach used during this workshop can help guide communities in their efforts to build their own measures of resilience. This publication summarizes the presentations and discussions from the workshop." Developing a Framework for Measuring Community Resilience: "The 2012 National Research Council report Disaster Resilience: A National Imperative highlighted the challenges of increasing national resilience in the United States. One finding of the report was that "without numerical means of assessing resilience, it would be impossible to identify the priority needs for improvement, to monitor changes, to show that resilience had improved, or to compare the benefits of increasing resilience with the associated costs." Although measuring resilience is a challenge, metrics and indicators to evaluate progress, and the data necessary to establish the metric, are critical for helping communities to clarify and formalize what the concept of resilience means for them, and to support efforts to develop and prioritize resilience investments. 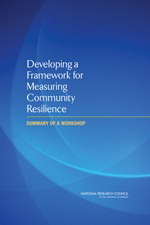 One of the recommendations from the 2012 report stated that government entities at federal, state, and local levels and professional organizations should partner to help develop a framework for communities to adapt to their circumstances and begin to track their progress toward increasing resilience. 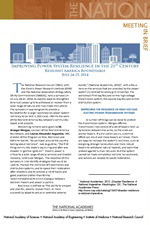 To build upon this recommendation and begin to help communities formulate such a framework, the Resilient America Roundtable of the National Academies convened the workshop Measures of Community Resilience: From Lessons Learned to Lessons Applied on September 5, 2014 in Washington, D.C. The workshop's overarching objective was to begin to develop a framework of measures and indicators that could support community efforts to increase their resilience. The framework will be further developed through feedback and testing in pilot and other partner communities that are working with the Resilient America Roundtable. This report is a summary of the one-day workshop, which consisted of a keynote address and two panel sessions in the morning and afternoon breakout sessions that began the discussion on how to develop a framework of resilience measures." Improving Power System Resilience in the 21st Century: "The National Research Council (NRC), with the Electric Power Research Institute (EPRI) and the National Association of Regulatory Utility Commissioners (NARUC), held a symposium on July 24 -25, 2014, to explore ways to strengthen America’s power grid to withstand or recover from a wide range of natural and man-made disruptions." Disaster Resilience: A National Imperative: "No person or place is immune from disasters or disaster-related losses. Infectious disease outbreaks, acts of terrorism, social unrest, or financial disasters in addition to natural hazards can all lead to large-scale consequences for the nation and its communities. Communities and the nation thus face difficult fiscal, social, cultural, and environmental choices about the best ways to ensure basic security and quality of life against hazards, deliberate attacks, and disasters. Beyond the unquantifiable costs of injury and loss of life from disasters, statistics for 2011 alone indicate economic damages from natural disasters in the United States exceeded $55 billion, with 14 events costing more than a billion dollars in damages each. One way to reduce the impacts of disasters on the nation and its communities is to invest in enhancing resilience--the ability to prepare and plan for, absorb, recover from and more successfully adapt to adverse events. Disaster Resilience: A National Imperative addresses the broad issue of increasing the nation's resilience to disasters. 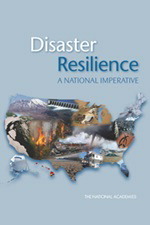 This book defines "national resilience", describes the state of knowledge about resilience to hazards and disasters, and frames the main issues related to increasing resilience in the United States. It also provide goals, baseline conditions, or performance metrics for national resilience and outlines additional information, data, gaps, and/or obstacles that need to be addressed to increase the nation's resilience to disasters. Additionally, the book's authoring committee makes recommendations about the necessary approaches to elevate national resilience to disasters in the United States."